It’s time to tell you more about us, the human beings on the other side of the searcher. The ones who wake up in the middle of the night thinking about that unsolved bug. The ones who get butterflies in their stomachs after a positive comment on Twitter. In this post you will discover who the Trabber members are, and what functions do we perform. You will see that we are few, perhaps fewer than you imagined, but we are sufficiently committed, because thanks to our persistence and to your support, we can proudly state that we just turned out 10 years old! … according to your opinion, which one would be better? The natural thing would be to think that the second one, right? Because “millions” gives a greater sense of completeness that “71“. But what would you think if we told you that most agency websites already give access to millions of flights by themselves, or what is the same, that “We search in millions of websites” could actually be synonymous with ‘We search hin one web’? 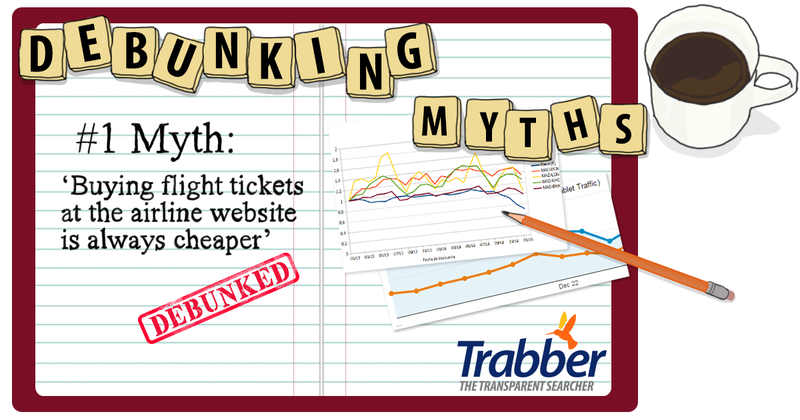 One of the false “myths” we have heard more and that seems to be more consolidated between travellers is the one that says that flight tickets are cheaper when purchased on the airlines website. Contrary to popular belief, flying Business Class doesn’t have to be much more expensive than Economy Class. In fact, if you plan your trip in advance and know well how airlines’ policies work, there are odds that you get a free “upgrade” to Business, that is to say, that the airline changes your ticket from Tourist to Business without any additional expense on your part. 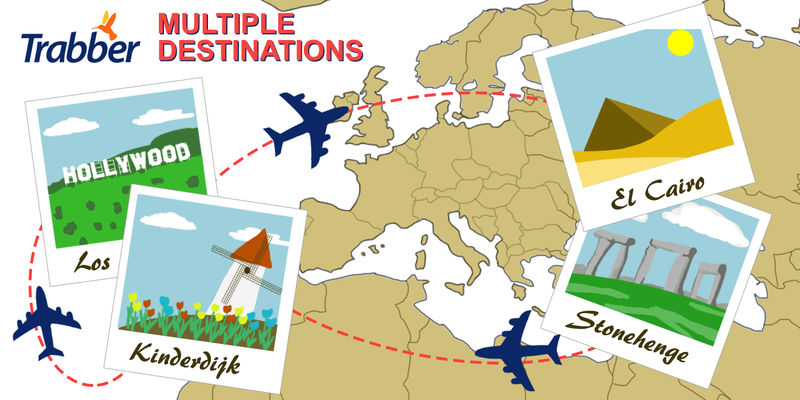 Even though searches with multiple destinations are not as common as round trips, they represent the best option in many cases, especially in travels with various destinations. In Trabber we just added the option to 14 new countries: Germany, Argentina, Brazil, Canada, Chile, Colombia, United States, France, India, Mexico, New Zealand, Peru, Portugal and South Africa. Countries that join those that already had the function: Spain, Ireland, Italy and the UK. If you are planning your vacation this year and want to travel several destinations, you can take the opportunity to make a multiple destinations search. With the latest update of Trabber search engine, we are getting close to the round number of 100 providers on all our vertical search engines. Olympic Airlines. This airline was the flag carrier of Greece until 2009. The company operates services to 37 domestic destinations and to 32 destinations world-wide. Evelop Airlines. This airline belongs to Barcelò Group and it is based at Palma de Mallorca airport. This year the company has transformed itself from a charter airline to a regular airline. For now it offers flights from Madrid-Barajas airport to destinations in the Caribbean. Croatia Airlines. It is the national airline of Croatia. It operates from its base at the airport in Zagreb. We also add two new providers to the Car Rental search engine on this update: GoldCar and Enterprise Rent A Car. We believe that after adding these two news providers, you will notice an improvement on many of your searches. Definitely we encourage you to try this new version! Finally, we add to the Hotel search engine a new provider, Budgetplaces, an online consolidator specialized in budget hotels, hostels and B&B, with over 10,000 accomodations in 100 countries worldwide. We continue the development of Trabber Planner, a tool that can help you organizing your trips and reservations. This new version of Trabber Planner is capable to interpret confirmation emails from almost 150 travel sites, including all the most popular travel sites on the Internet. Create the page for your trip and add your travel friends to discuss options. Save flights, hotels and rental cars that interest you, by clicking on the “save” link on Trabber search engine results. Once you book, forward the confirmation emails from online travel agencies, airlines websites, etc. to .All the data will be processed and made available for you and your travel friends. Note that you can use Trabber Planner even if you use other tools to search. You can also forward confirmation emails for other tourism products and they will also be attached to your trip in Trabber. We have added support for five new airlines websites to Trabber flight search engine. Currently, we are focusing on adding support for new airlines and other travel suppliers to enhance Trabber’s results on all international Trabber versions. Probably at the moment there is no other travel search engine that offers users such a broad set of results as Trabber. Jet2.com is a British low-cost airline that operates from several UK airports to more than 50 destinations in Europe. Austrian is the flag carrier of Austria and a subsidiary of the Lufthansa Group. The airline operates from Vienna International Airport. The airline is a member of the Star Alliance. Air Viva, travels to exotic destinations and has international connections in Africa, Alaska, Russia, China and India. Avianca is the national airline and flag carrier of Colombia and one of the largest airlines in South America. It operates flights to 100 destinations in 25 countries. Aegean Airlines is the largest Greek airline by total number of passengers carried, by number of destinations served and by fleet size. It operates flights from Athens and Thessaloniki to other major cities in Greece and destinations in Europe, especially to Germany. Aegean Airlines is a member of Star Alliance since June 2010. We always like to hear your suggestions, so please tell us; What other airlines should we add to Trabber?